Our goal is to develop a standard method of sampling mosquitoes that breed in containers. These include mosquitoes that have caused lots of trouble for people for many thousands of years. In addition to being pests, these insects can also carry serious diseases. Container-breeding mosquitoes lay their eggs in small bodies of water, including water that gathers in trees and some smaller plants. Some mosquitoes also breed in other water-holding containers that we leave around, and this includes many possible places, such as tires, buckets, drain pipes, and flower pots. Just about any small body of water that stays around for over a week during the summer is a possible place for some mosquito to lay its eggs. If the water remains for long enough, the eggs can hatch and the immature stages (larvae) can develop. One convenient way of estimating how many mosquitoes are in an area is to place traps where mosquitoes will lay eggs, and to count the eggs laid in those traps. North America has recently been invaded by a mosquito from Asia, which arrived here when many used tires were imported for recycling. 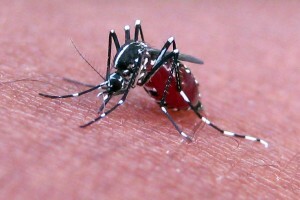 This Asian Tiger Mosquito has been successful, beginning in the Gulf coast region, spreading throughout the Southeast, and has become the most common container breeder in places that were once dominated by a species introduced from Africa during the slave trade, the Yellow Fever mosquito. One of our goals is to estimate the northern limits of the range of this species. We are also interested in the effect of this introduced mosquito on a native species, the Eastern Treehole Mosquito. This species occupies treeholes and other containers in shady places throughout the eastern US. The invasion provides the opportunity to determine how strongly these two species affect each other’s success, to make predictions about the long-term outcome of the invasion, and to test those predictions. To do this, we need to sample many different locations, estimate the abundance of the different species in each area, and track their abundance through time. We have enlisted over 40 teachers and group leaders to help us with this task, and they will in turn be helped by over 1000 students. We do not know of any study that has followed this many populations simultaneously for any organism, and we hope this effort can be extended for at least several years. If we can, this will become a study of populations at a uniquely large scale. Along the way, we also hope to help teachers engage students in the process of science, which can be done anywhere using ordinary household objects and simple equipment.